I'm making an effort, to cook more fish. Moe loves all fish. Me? Not so much. The only fish that I can honestly say I enjoy is halibut. 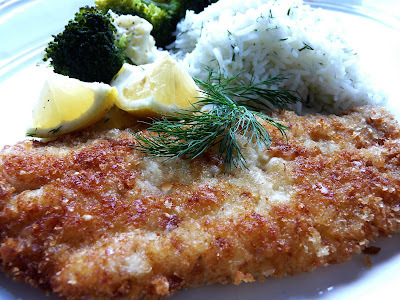 Petrale Sole is almost always available fresh and I don't mind it. And it is a fish that can be fried, poached, baked, stuffed, etc. We had it last week, just pan fried almondine style. Last night we had breaded sole. 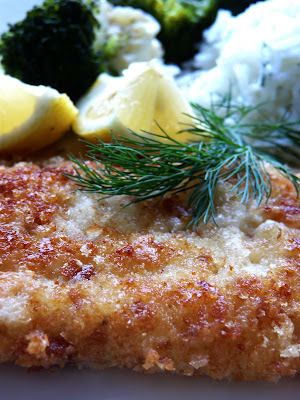 The fresh bread crumbs were seasoned with lemon zest and fresh grated Parmesan cheese. I added fresh chopped dill and the juice of half a lemon to the rice. See how to make the Perfect Rice every time. That dinner you made is one of my kids very favorites! Mine too! Beautifully done! I can just imagine how flaky and fresh it tastes....yummm. Your meals always look great, Ann. I'm not much of a fish person, either (now shellfish - that's another story! ), but meals like this could definitely change my mind! Good thing you have Moe around to persuade you to eat fish! I can get lazy and either broil or saute it...I'll give this yummy looking recipe a try to break out of my rut...thanks! I have been reading your blog for quite some time. It is absolutely beautiful. I love your recipes and photos. Your sole looks de-lish! Bravo! I agree with you. I rarely crave fish, but I try and cook it at least once a week. I prefer milder fish, like petrale sole. This looks so delicious! Great job. Hi, I just found your blog via google, looking for sausage gravy =) Love you blog, lots of home cooking, like mine. You got yourself an instant follower! Sole is one of my favorites and this is the perfect way to prepare it. Looks fantastic, Ann.